The conservation of a former tenement house at 14 Henrietta Street in Dublin's north inner city has been named Best Conservation/Restoration Project, and has won the Special RIAI* Jury Award at the prestigious annual RIAI Irish Architecture Awards. Dublin City Council undertook to save and renovate 14 Henrietta Street more than a decade ago, when it was in a seriously derelict state. After painstaking restoration, the building will be officially opened in September as a social history museum telling the story of the Georgian townhouse's shifting fortunes, from aristocratic family home and powerbase to courthouse; from barracks to its final incarnation as a tenement house. In the 1911 census, more than 100 people from 17 families lived in the building and it was not until 1979 that the last occupants left. The stories of the house and street – the latter now the most intact collection of early- to mid-18th century town houses in Ireland – mirror the story of Dublin and her citizens and how social change impacted on them. 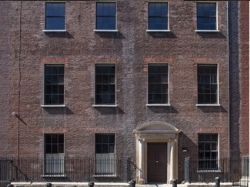 While 14 Henrietta Street will officially open in September 2018, advance tours are available on Fridays and Saturdays in July and August, with an opportunity for the visitors to feed back their memories, stories and reflections. Tickets (€9 adult / €6 concession) for the 90-minute tour should be booked in advance at www.14henriettastreet.ie.